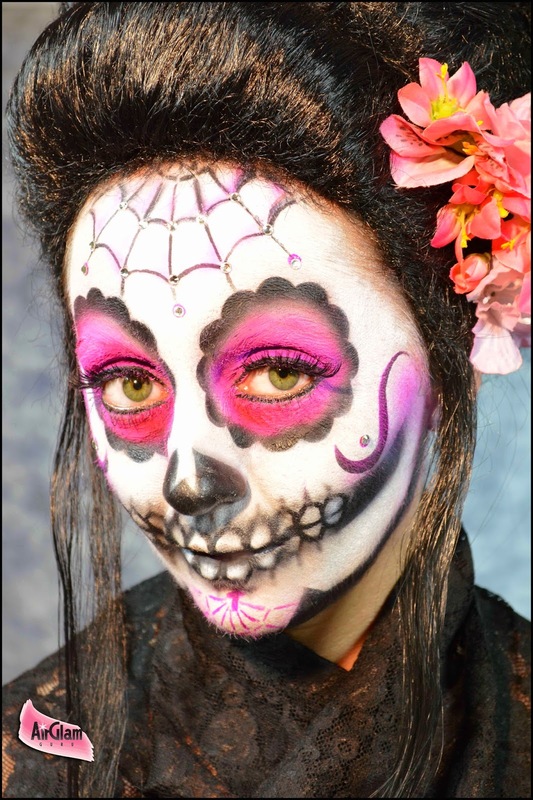 Summer holidays are over, school is in and Halloween is approaching fast! 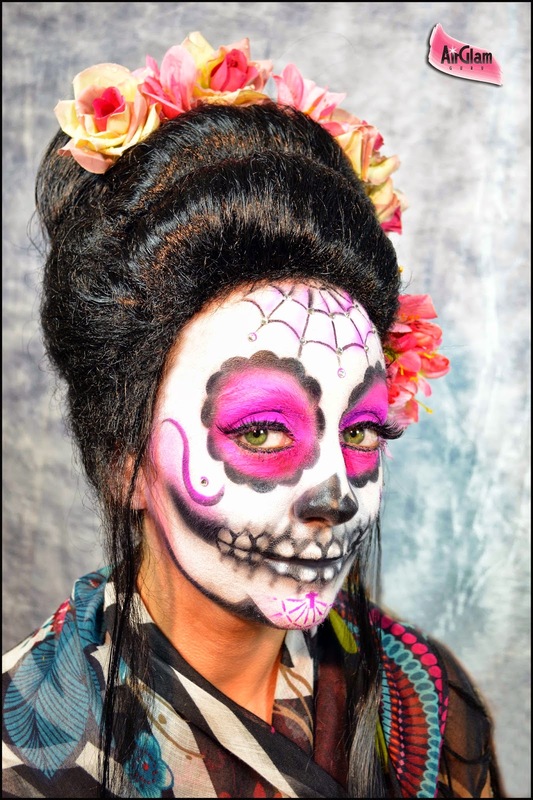 And talking of speed, I was recently chatting with a makeup artist friend about a Halloween gig where she had to paint Sugar Skull makeups on a bunch of people in a very short time. I said to her that airbrushing would probably have been a good idea, and that with a few stencils and a couple of extra airbrushes to avoid time consuming color changes the whole endeavour could have turned into a whole lot of fun. A year later I am challenging myself to "walk my talk", and the results are in this video. The process is not exactly super fast as I chose to experiment with detail and decorations, but I hope it gives you a fair idea of how fun the process can be. In this video I am using stencils that I made by myself, and I decided to make the templates available to you our new FREE STENCILS page. Graftobian of course distributes the great BadAss Stencil line, and I would have used some of those too, but they were scheduled to arrive after the shooting deadline for the video. In this look I also wanted to try out my new Graftobian GlamAire F/X Neon colors, and of course to use my new Graftobian Walk-Around System that I purchased early this summer at CRCmakeup.com. The colors are fantastic. They have an amazing payoff, they are super resistant and have a very low viscosity, which in layman terms means that they clear out of your airbrush beautifully, with hardly any residue. I did not have a hint of a clogging problem while using them. The bottles are a large 2 oz. size, which of course you need if you are going to do body painting. The formula is an alcohol and water base hybrid, and dries fast to a matte finish. I found it to be very gentle on the skin and odor free. grande tecnica!davvero vorrei vederlo al buio per l'effetto fluo! This trick I liked it a lot, the new colors you've used are gorgeous, I also wanted to see the effect in the dark, had to be great! 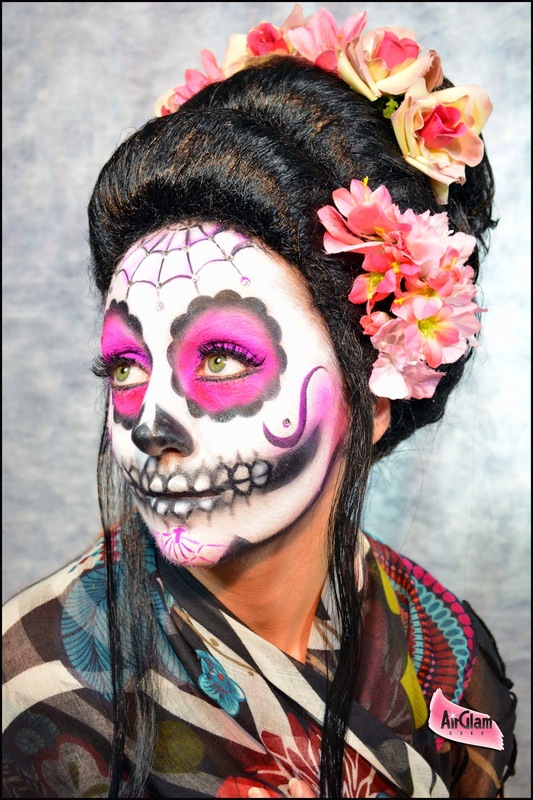 truly a sugar skull spectacular .. I really like the colors used ! Fantastic ...you are an Artist!! !